For the chemical element, see phosphorus. A phosphor, most generally, is a substance that exhibits the phenomenon of luminescence. Somewhat confusingly, this includes both phosphorescent materials, which show a slow decay in brightness (> 1 ms), and fluorescent materials, where the emission decay takes place over tens of nanoseconds. Phosphorescent materials are known for their use in radar screens and glow-in-the-dark materials, whereas fluorescent materials are common in cathode ray tube (CRT) and plasma video display screens, fluorescent lights, sensors, and white LEDs. Phosphors are often transition-metal compounds or rare-earth compounds of various types. The most common uses of phosphors are in CRT displays and fluorescent lights. 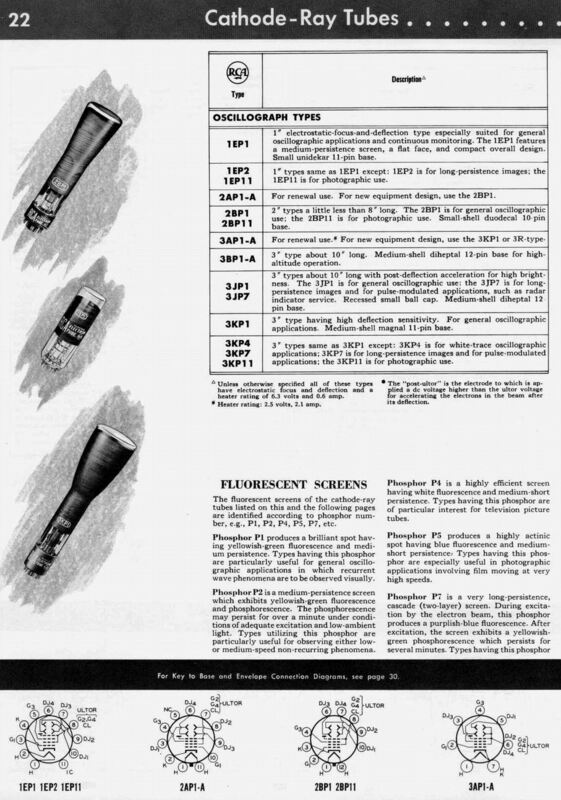 CRT phosphors were standardized beginning around World War II and designated by the letter "P" followed by a number. Phosphorus, the chemical element named for its light-emitting behavior, emits light due to chemiluminescence, not phosphorescence. In inorganic phosphors, these inhomogeneities in the crystal structure are created usually by addition of a trace amount of dopants, impurities called activators. (In rare cases dislocations or other crystal defects can play the role of the impurity.) The wavelength emitted by the emission center is dependent on the atom itself and on the surrounding crystal structure. The scintillation process in inorganic materials is due to the electronic band structure found in the crystals. An incoming particle can excite an electron from the valence band to either the conduction band or the exciton band (located just below the conduction band and separated from the valence band by an energy gap). This leaves an associated hole behind, in the valence band. Impurities create electronic levels in the forbidden gap. The excitons are loosely bound electron–hole pairs that wander through the crystal lattice until they are captured as a whole by impurity centers. The latter then rapidly de-excite by emitting scintillation light (fast component). In case of inorganic scintillators, the activator impurities are typically chosen so that the emitted light is in the visible range or near-UV, where photomultipliers are effective. The holes associated with electrons in the conduction band are independent from the latter. Those holes and electrons are captured successively by impurity centers exciting certain metastable states not accessible to the excitons. The delayed de-excitation of those metastable impurity states, slowed down by reliance on the low-probability forbidden mechanism, again results in light emission (slow component). BaMgAl10O17:Eu2+ (BAM), a plasma-display phosphor, undergoes oxidation of the dopant during baking. Three mechanisms are involved; absorption of oxygen atoms into oxygen vacancies on the crystal surface, diffusion of Eu(II) along the conductive layer, and electron transfer from Eu(II) to absorbed oxygen atoms, leading to formation of Eu(III) with corresponding loss of emissivity. Thin coating of aluminium phosphate or lanthanum(III) phosphate is effective in creating a barrier layer blocking access of oxygen to the BAM phosphor, for the cost of reduction of phosphor efficiency. Addition of hydrogen, acting as a reducing agent, to argon in the plasma displays significantly extends the lifetime of BAM:Eu2+ phosphor, by reducing the Eu(III) atoms back to Eu(II). Y2O3:Eu phosphors under electron bombardment in presence of oxygen form a non-phosphorescent layer on the surface, where electron–hole pairs recombine nonradiatively via surface states. ZnS:Mn, used in AC thin-film electroluminescent (ACTFEL) devices degrades mainly due to formation of deep-level traps, by reaction of water molecules with the dopant; the traps act as centers for nonradiative recombination. The traps also damage the crystal lattice. Phosphor aging leads to decreased brightness and elevated threshold voltage. ZnS and CdS phosphors degrade by reduction of the metal ions by captured electrons. The M2+ ions are reduced to M+; two M+ then exchange an electron and become one M2+ and one neutral M atom. The reduced metal can be observed as a visible darkening of the phosphor layer. The darkening (and the brightness loss) is proportional to the phosphor's exposure to electrons and can be observed on some CRT screens that displayed the same image (e.g. a terminal login screen) for prolonged periods. The host materials are typically oxides, nitrides and oxynitrides, sulfides, selenides, halides or silicates of zinc, cadmium, manganese, aluminium, silicon, or various rare-earth metals. The activators prolong the emission time (afterglow). In turn, other materials (such as nickel) can be used to quench the afterglow and shorten the decay part of the phosphor emission characteristics. Phosphors used for fluorescent lamps require a multi-step production process, with details that vary depending on the particular phosphor. Bulk material must be milled to obtain a desired particle size range, since large particles produce a poor-quality lamp coating, and small particles produce less light and degrade more quickly. During the firing of the phosphor, process conditions must be controlled to prevent oxidation of the phosphor activators or contamination from the process vessels. After milling the phosphor may be washed to remove minor excess of activator elements. Volatile elements must not be allowed to escape during processing. Lamp manufacturers have changed composition of phosphors to eliminate some toxic elements, such as beryllium, cadmium, or thallium, formerly used. Phosphor layers provide most of the light produced by fluorescent lamps, and are also used to improve the balance of light produced by metal halide lamps. Various neon signs use phosphor layers to produce different colors of light. Electroluminescent displays found, for example, in aircraft instrument panels, use a phosphor layer to produce glare-free illumination or as numeric and graphic display devices. White LED lamps consist of a blue or ultra-violet emitter with a phosphor coating that emits at longer wavelengths, giving a full spectrum of visible light. Unfocused and undeflected cathode ray tubes were used as stroboscope lamps since 1958. Phosphor banded stamps first appeared in 1959 as guides for machines to sort mail. Around the world many varieties exist with different amounts of banding. Postage stamps are sometimes collected by whether or not they are "tagged" with phosphor (or printed on luminescent paper). Powder or AC electroluminescence is found in a variety of backlight and night light applications. Several groups offer branded EL offerings (e.g. IndiGlo used in some Timex watches) or "Lighttape", another trade name of an electroluminescent material, used in electroluminescent light strips. The Apollo space program is often credited with being the first significant use of EL for backlights and lighting. White light-emitting diodes are usually blue InGaN LEDs with a coating of a suitable material. Cerium(III)-doped YAG (YAG:Ce3+, or Y3Al5O12:Ce3+) is often used; it absorbs the light from the blue LED and emits in a broad range from greenish to reddish, with most of output in yellow. This yellow emission combined with the remaining blue emission gives the ���white” light, which can be adjusted to color temperature as warm (yellowish) or cold (blueish) white. The pale yellow emission of the Ce3+:YAG can be tuned by substituting the cerium with other rare-earth elements such as terbium and gadolinium and can even be further adjusted by substituting some or all of the aluminium in the YAG with gallium. However, this process is not one of phosphorescence. The yellow light is produced by a process known as scintillation, the complete absence of an afterglow being one of the characteristics of the process. Some rare-earth-doped Sialons are photoluminescent and can serve as phosphors. Europium(II)-doped β-SiAlON absorbs in ultraviolet and visible light spectrum and emits intense broadband visible emission. Its luminance and color does not change significantly with temperature, due to the temperature-stable crystal structure. It has a great potential as a green down-conversion phosphor for white LEDs; a yellow variant also exists (α-SiAlON). For white LEDs, a blue LED is used with a yellow phosphor, or with a green and yellow SiAlON phosphor and a red CaAlSiN3-based (CASN) phosphor. Some newer white LEDs use a yellow and blue emitter in series, to approximate white; this technology is used in some Motorola phones such as the Blackberry as well as LED lighting and the original version stacked emitters by using GaN on SiC on InGaP but was later found to fracture at higher drive currents. Many white LEDs used in general lighting systems can be used for data transfer, for example, in systems that modulate the LED to act as a beacon. Cathode ray tubes produce signal-generated light patterns in a (typically) round or rectangular format. Bulky CRTs were used in the black-and-white household television ("TV") sets that became popular in the 1950s, as well as first-generation, tube-based color TVs, and most earlier computer monitors. CRTs have also been widely used in scientific and engineering instrumentation, such as oscilloscopes, usually with a single phosphor color, typically green. Phosphors for such applications may have long afterglow, for increased image persistence. The phosphors can be deposited as either thin film, or as discrete particles, a powder bound to the surface. Thin films have better lifetime and better resolution, but provide less bright and less efficient image than powder ones. This is caused by multiple internal reflections in the thin film, scattering the emitted light. White (in black-and-white): The mix of zinc cadmium sulfide and zinc sulfide silver, the ZnS:Ag+(Zn,Cd)S:Ag is the white P4 phosphor used in black and white television CRTs. Mixes of yellow and blue phosphors are usual. Mixes of red, green and blue, or a single white phosphor, can also be encountered. Red: Yttrium oxide-sulfide activated with europium is used as the red phosphor in color CRTs. The development of color TV took a long time due to the search for a red phosphor. The first red emitting rare-earth phosphor, YVO4:Eu3+, was introduced by Levine and Palilla as a primary color in television in 1964. In single crystal form, it was used as an excellent polarizer and laser material. The phosphors are usually poor electrical conductors. This may lead to deposition of residual charge on the screen, effectively decreasing the energy of the impacting electrons due to electrostatic repulsion (an effect known as "sticking"). To eliminate this, a thin layer of aluminium (about 100 nm) is deposited over the phosphors, usually by vacuum evaporation, and connected to the conductive layer inside the tube. This layer also reflects the phosphor light to the desired direction, and protects the phosphor from ion bombardment resulting from an imperfect vacuum. The black-and-white television screens require an emission color close to white. Usually, a combination of phosphors is employed. The most common combination is ZnS:Ag+(Zn,Cd)S:Cu,Al (blue+yellow). Other ones are ZnS:Ag+(Zn,Cd)S:Ag (blue+yellow), and ZnS:Ag+ZnS:Cu,Al+Y2O2S:Eu3+ (blue + green + red – does not contain cadmium and has poor efficiency). The color tone can be adjusted by the ratios of the components. 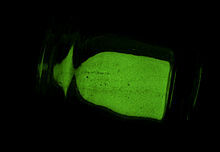 As the compositions contain discrete grains of different phosphors, they produce image that may not be entirely smooth. A single, white-emitting phosphor, (Zn,Cd)S:Ag,Au,Al overcomes this obstacle. Due to its low efficiency, it is used only on very small screens. The screens are typically covered with phosphor using sedimentation coating, where particles suspended in a solution are let to settle on the surface. For displaying of a limited palette of colors, there are a few options. In beam penetration tubes, different color phosphors are layered and separated with dielectric material. The acceleration voltage is used to determine the energy of the electrons; lower-energy ones are absorbed in the top layer of the phosphor, while some of the higher-energy ones shoot through and are absorbed in the lower layer. So either the first color or a mixture of the first and second color is shown. With a display with red outer layer and green inner layer, the manipulation of accelerating voltage can produce a continuum of colors from red through orange and yellow to green. Another method is using a mixture of two phosphors with different characteristics. The brightness of one is linearly dependent on electron flux, while the other one's brightness saturates at higher fluxes—the phosphor does not emit any more light regardless of how many more electrons impact it. At low electron flux, both phosphors emit together; at higher fluxes, the luminous contribution of the nonsaturating phosphor prevails, changing the combined color. Such displays can have high resolution, due to absence of two-dimensional structuring of RGB CRT phosphors. Their color palette is, however, very limited. They were used e.g. in some older military radar displays. The phosphors in color CRTs need higher contrast and resolution than the black-and-white ones. The energy density of the electron beam is about 100 times greater than in black-and-white CRTs; the electron spot is focused to about 0.2 mm diameter instead of about 0.6 mm diameter of the black-and-white CRTs. Effects related to electron irradiation degradation are therefore more pronounced. Color CRTs require three different phosphors, emitting in red, green and blue, patterned on the screen. Three separate electron guns are used for color production. The composition of the phosphors changed over time, as better phosphors were developed and as environmental concerns led to lowering the content of cadmium and later abandoning it entirely. The (Zn,Cd)S:Ag,Cl was replaced with (Zn,Cd)S:Cu,Al with lower cadmium/zinc ratio, and then with cadmium-free ZnS:Cu,Al. For projection televisions, where the beam power density can be two orders of magnitude higher than in conventional CRTs, some different phosphors have to be used. For blue color, ZnS:Ag,Cl is employed. However, it saturates. (La,Gd)OBr:Ce,Tb3+ can be used as an alternative that is more linear at high energy densities. For green, a terbium-activated Gd2O2Tb3+; its color purity and brightness at low excitation densities is worse than the zinc sulfide alternative, but it behaves linear at high excitation energy densities, while zinc sulfide saturates. However, it also saturates, so Y3Al5O12:Tb3+ or Y2SiO5:Tb3+ can be substituted. LaOBr:Tb3+ is bright but water-sensitive, degradation-prone, and the plate-like morphology of its crystals hampers its use; these problems are solved now, so it is gaining use due to its higher linearity. Y2O2S:Eu3+ is used for red emission. P23 – White 575,460 nm – Short CRT Registered by United States Radium Corporation. P24, GE ZnO:Zn Green 505 nm – 1–10 µs VFD most common phosphor in vacuum fluorescent displays. ^ Emsley, John (2000). The Shocking History of Phosphorus. London: Macmillan. ISBN 978-0-330-39005-7. ^ a b c d e f g Peter W. Hawkes (1 October 1990). Advances in electronics and electron physics. Academic Press. pp. 350–. ISBN 978-0-12-014679-6. Retrieved 9 January 2012. ^ Bizarri, G; Moine, B (2005). "On phosphor degradation mechanism: thermal treatment effects". Journal of Luminescence. 113 (3–4): 199. Bibcode:2005JLum..113..199B. doi:10.1016/j.jlumin.2004.09.119. ^ Tanno, Hiroaki; Fukasawa, Takayuki; Zhang, Shuxiu; Shinoda, Tsutae; Kajiyama, Hiroshi (2009). "Lifetime Improvement of BaMgAl10O17:Eu2+ Phosphor by Hydrogen Plasma Treatment". Japanese Journal of Applied Physics. 48 (9): 092303. Bibcode:2009JaJAP..48i2303T. doi:10.1143/JJAP.48.092303. ^ Ntwaeaborwa, O. M.; Hillie, K. T.; Swart, H. C. (2004). "Degradation of Y2O3:Eu phosphor powders". Physica Status Solidi C. 1 (9): 2366. Bibcode:2004PSSCR...1.2366N. doi:10.1002/pssc.200404813. ^ Wang, Ching-Wu; Sheu, Tong-Ji; Su, Yan-Kuin; Yokoyama, Meiso (1997). "Deep Traps and Mechanism of Brightness Degradation in Mn-doped ZnS Thin-Film Electroluminescent Devices Grown by Metal-Organic Chemical Vapor Deposition". Japanese Journal of Applied Physics. 36 (5A): 2728. Bibcode:1997JaJAP..36.2728W. doi:10.1143/JJAP.36.2728. ^ Xie, Rong-Jun; Hirosaki, Naoto (2007). "Silicon-based oxynitride and nitride phosphors for white LEDs—A review". Sci. Technol. Adv. Mater. 8 (7–8): 588. Bibcode:2007STAdM...8..588X. doi:10.1016/j.stam.2007.08.005. ^ Li, Hui-Li; Hirosaki, Naoto; Xie, Rong-Jun; Suehiro, Takayuki; Mitomo, Mamoru (2007). "Fine yellow α-SiAlON:Eu phosphors for white LEDs prepared by the gas-reduction–nitridation method". Sci. Technol. Adv. Mater. 8 (7–8): 601. Bibcode:2007STAdM...8..601L. doi:10.1016/j.stam.2007.09.003. ^ Kane, Raymond and Sell, Heinz (2001) Revolution in lamps: a chronicle of 50 years of progress, 2nd ed. The Fairmont Press. ISBN 0-88173-378-4. Chapter 5 extensively discusses history, application and manufacturing of phosphors for lamps. ^ "Vacuum light sources — High speed stroboscopic light sources data sheet" (PDF). Ferranti, Ltd. August 1958. Archived (PDF) from the original on 20 September 2016. Retrieved 7 May 2017. ^ SEEING PHOSPHOR BANDS on U.K. STAMPS Archived 2015-10-19 at the Wayback Machine. ^ Phosphor Bands Archived 2017-03-17 at the Wayback Machine. ^ XTECH, NIKKEI. "Sharp to Employ White LED Using Sialon". NIKKEI XTECH. Retrieved 2019-01-10. ^ Youn-Gon Park; et al. "Luminescence and temperature dependency of β-SiAlON phosphor". Samsung Electro Mechanics Co. Archived from the original on 2010-04-12. ^ Hideyoshi Kume, Nikkei Electronics (Sep 15, 2009). "Sharp to Employ White LED Using Sialon". Archived from the original on 2012-02-23. ^ Naoto, Hirosaki; et al. (2005). "New sialon phosphors and white LEDs". Oyo Butsuri. 74 (11): 1449. Archived from the original on 2010-04-04. ^ Fudin, M.S. ; et al. (2014). "Frequency characteristics of modern LED phosphor materials". Scientific and Technical Journal of Information Technologies, Mechanics and Optics. 14 (6): 71. Archived from the original on 2015-06-26. ^ Fields, R. A.; Birnbaum, M.; Fincher, C. L. (1987). "Highly efficient Nd:YVO4 diode-laser end-pumped laser". Applied Physics Letters. 51 (23): 1885. Bibcode:1987ApPhL..51.1885F. doi:10.1063/1.98500. ^ a b c d Lakshmanan, p. 54. ^ Shionoya, Shigeo (1999). 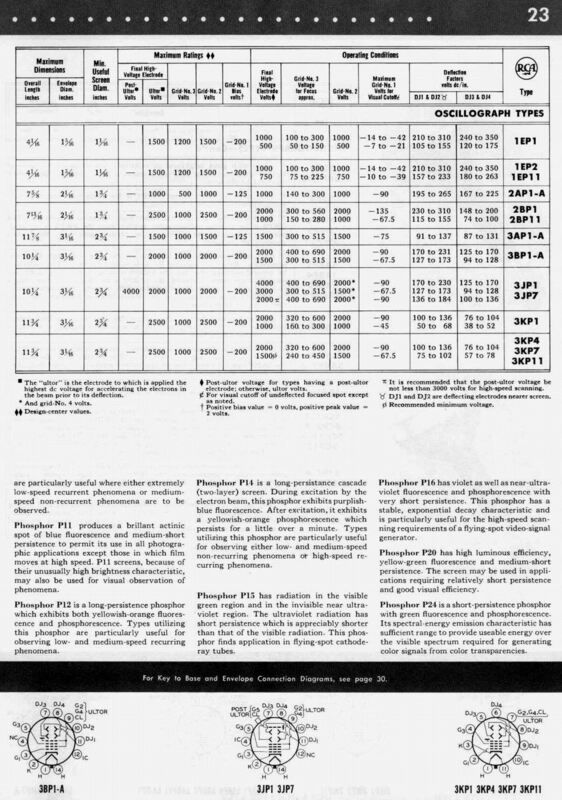 "VI: Phosphors for cathode ray tubes". Phosphor handbook. Boca Raton, Fla.: CRC Press. ISBN 978-0-8493-7560-6. ^ a b c d e f g h i j k l m n o p q r s t u "Osram Sylvania fluorescent lamps". Archived from the original on July 24, 2011. Retrieved 2009-06-06. Arunachalam Lakshmanan (2008). Luminescence and Display Phosphors: Phenomena and Applications. Nova Publishers. ISBN 978-1-60456-018-3. Look up phosphor in Wiktionary, the free dictionary.